Can we – finally – somehow – respectfully – all calm down now? Yes, we elected a president who says mean things. Yes, part of the response to that is the rise of whackos who want to destroy the president, impeach the president, pretend that the president wasn’t elected and flip the nation over to socialism. Because, you know, socialism has worked so well throughout history and you only need to take Cynthia Nixon’s word on that. If Miranda says so, it’s got to be true. Respectfully, I don’t think that – no matter how polarized we appear to be – anyone’s opponents are as stupid, self-serving or downright evil as the other side portrays them to be. Clearly, portraying one’s ideological opponent as stupid, self-serving and/or downright evil is an easy tactic to utilize. No defense necessary. We appeal to hyperbole, on both sides, because it’s so damn easy to do so. A hard-core liberal will dismiss anything a conservative has to say about an issue that even remotely involves race on the basis that conservatives are uniformly racist. Similarly, hard-core conservatives will dismiss anything the left has to say about gun-control when they do so on the basis that every single person on the left believes that guns are inherently evil. We’re wrestling with multiple issues at the same time. Cynthia Nixon and her supporters appeal to the notion that socialism can and should make the world a better place. Moderate Democrats are trying to walk a very fine line between aging leftists who veer toward the center and new liberals who are all-in with socialist agendas. On the right, we have – at the extreme – old-school, hard-case right-wing crazies who are angry, racist misogynists. The number of people who exist on that extreme are few and growing fewer day by day. Indeed the opposite is true. The diversity among influential people on the right grows, while the left constricts to engage white guilt as closely as possible, the supposed cause of all the world’s ills. Consider the two cartoonists who are, arguably, the most influential editorial cartoonists in America today: Michael Ramirez and A.F. 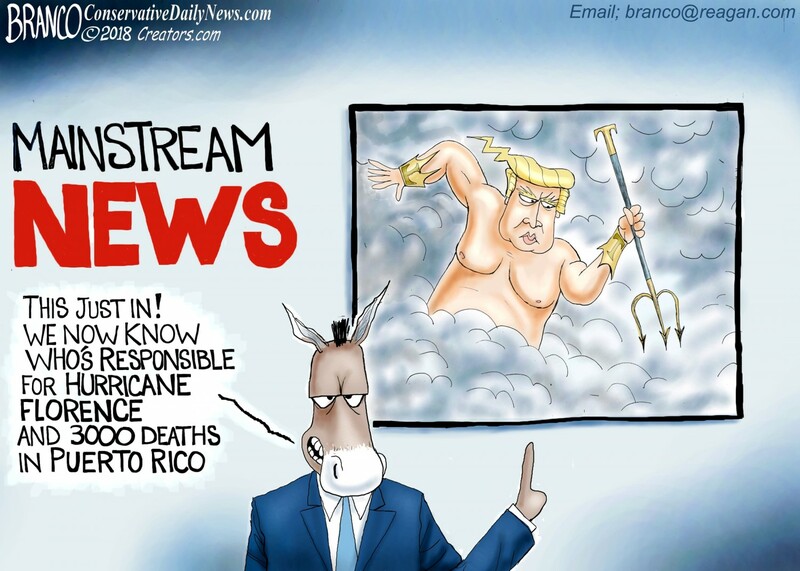 Branco (the latter a regular contributor to the Mighty Examiner). Neither is ethnically Caucasian. They identify with non-Caucasian roots and are thus free to express their opinions without considering the constrictions of identity politics. Ramirez and Branco aren’t focused on white guilt, neither being white, so they are free to move beyond identity to substance. The left’s chief complaints about President Trump have involved style. Trump was elected because he is a non-traditional politician and he is criticized by the left and the MSM because he refuses to back off. Just about everyone, including me, finds something that Trump says or tweets cringe-worthy at one time or another. OK. So what? I’m not judging President Donald Trump on his ability to engage in polite conversation. Indeed, I believe that he has no obligation to do so. Starting with Nixon and running through both Bush’s, Republican presidents have tried to take the high-road, the polite-road with the mainstream media and it never mattered. They could be as civil as civil can be, yet they were crucified anyway. So why bother trying to play nice, when you’re going to get dumped on whatever you do? Trump figured that out and I applaud him for doing so.